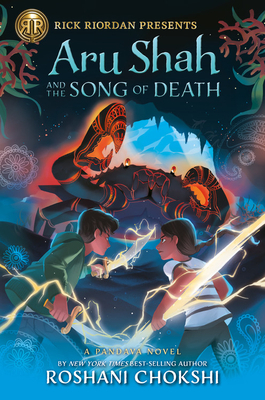 Best-selling author Rick Riordan presents best-selling author Roshani Chokshi and her sequel to Aru Shah and the End of Time. Aru is only just getting the hang of this whole Pandava thing when the Otherworld goes into full panic mode. The god of love's bow and arrow have gone missing, and the thief isn't playing Cupid. Instead, they're turning people into heartless fighting-machine zombies. If that weren't bad enough, somehow Aru gets framed as the thief. If she doesn't find the arrow by the next full moon, she'll be kicked out of the Otherworld. For good. But, for better or worse, she won't be going it alone. Along with her soul-sister, Mini, Aru will team up with Brynne, an ultra-strong girl who knows more than she lets on, and Aiden, the boy who lives across the street and is also hiding plenty of secrets. Together they'll battle demons, travel through a glittering and dangerous serpent realm, and discover that their enemy isn't at all who they expected. Roshani Chokshi (www.roshanichokshi.com) is the author of the instant New York Times best-selling first book in the Pandava series, Aru Shah and the End of Time. She also wrote the New York Times best-selling YA book The Star-Touched Queen, and its companion, A Crown of Wishes. She studied fairy tales in college, and she has a pet luck dragon that looks suspiciously like a Great Pyrenees dog. The Pandava novels were inspired by the stories her grandmother told her as well as Roshani's all-consuming love for Sailor Moon. She lives in the south and says "y'all," but she doesn't really have a Southern accent. Her Twitter handle is @roshani_chokshi.